The St. Patricks Day Parade was covered by Sydsvenskan, and you can find the online version here. The ladies’ team, along with the ladies’ team hosted a training session by Lizzy Kent, who travelled from Wexford to hold a coaching session with the ladies of Malmö, Copenhagen, Aarhus and Gothenburg. This was covered by ladiesgaelic.ie. 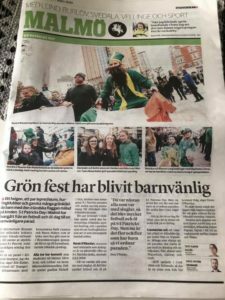 Club member and sometimes St. Patrick, Denis O’Riordan was interviewed by Malmö 24 after a successful St. Patrick’s Day Parade. The club features in Joe.ie’s Around the World in 80 Clubs. 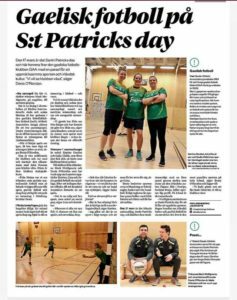 Sydsvenskan mentioned GAA in a feature on international sports in Malmö. 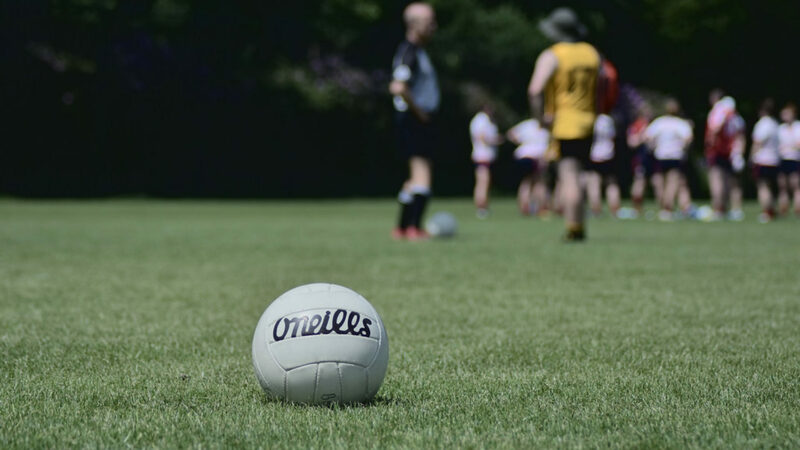 With the Eurovision taking place in Malmö, Austrian TV station ORF came for a look as Ireland’s Ryan Dolan and Austria’s Natália Kelly tried their hand at Gaelic Football. Check out the video on our facebook. When they heard about Malmö GAA’s success in Europe, Sydsvenskan ran a feature on the club. As Malmö GAA started to grow, The Local helped to spread the word.